Eta Carinae, the seemingly bright yellow star toward upper left, is actually a blue hypergiant on the way to being a Wolf Rayett star. 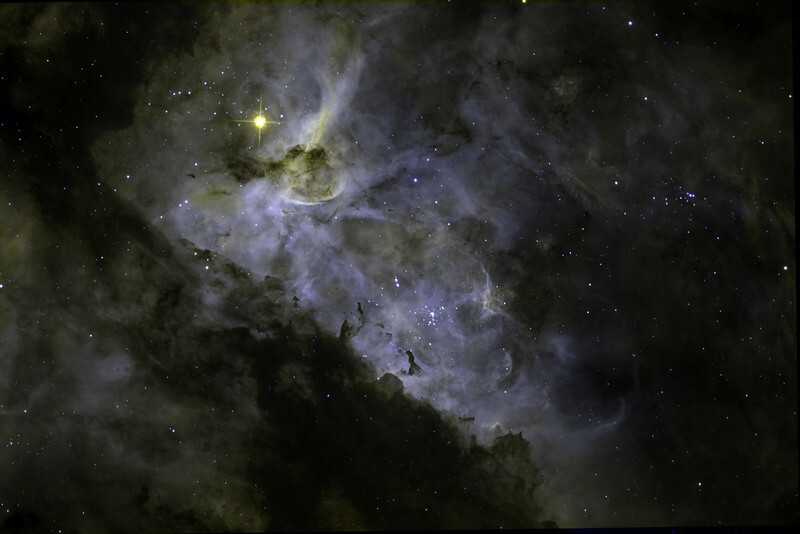 The Keyhole nebula is jsut below Eta, and the Fickle Finger is a tiny structure below that. To the right of centre is an intricate structure including bipolar jets associated with two Herbig-Haro objects. Green: H-alpha 6Hrs, Blue O-III 4H. STL11000M on 20" PlaneWave CDK on modified MI-750 fork. All software, firmware, and electronics is my own design and build.